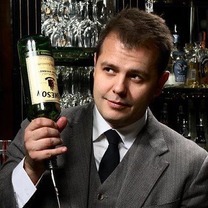 Simon is a leading voice of the global cocktail and bar industry with over 20 years experience in bartending, educating on cocktails & spirits and marketing some of the biggest spirits brands on the planet. He is regularly invited to lead education sessions, judge global competitions, and deliver seminars at international conferences. His expertise is often requested in the media with appearances on Emeril Lagasse’s “Emeril’s Table,” CNN , Fox, Wall Street Journal Live, and a series of how-to video’s for Liquor.com. He has been featured in numerous publications, including the New York Times, Forbes, Harper’s Bazaar, Wall Street Journal, Men’s Health, the Huffington Post, and was featured on the cover of Tasting Panel in 2012. Simon was awarded Best International Brand Ambassador in 2007 and Best US Brand Ambassador in 2009 for his work on Plymouth Gin at the Tales of the Cocktail Spirited Awards. Simon is now the co-founder and co-creator of Fords Gin, a gin that was created with the input of professional bartenders and made by celebrated 8th generation Master Distiller Charles Maxwell. Fords Gin was launched in September 2012 and running the company now takes up most of Simon’s time and with what little time he has spare he uses to travel and hit cool bars. "Opening night at Dama and they crushed it - Thank you @stevelivigni - Everything was delicious and on point - good luck with the rest of the opening nights." "On Thursday I was feeling under the weather but managed to muster up the energy to go and see @saxonandparole For me he is one of the great faces of the Hospitality industry and responsible for many great times for me. He moves on to open his new place in a month or so. It’s the end of an era but the beginning of a new one and I can’t wait to see what’s next for him. One thing I know is it’s going to be good and it’s going to be fun. These pictures show what a consummate host he is. Even on his last night he was thinking about how to make the evening special for me as shown in these pictures when Masa came out to the street and made me a personalized Champagne Negroni #legend"
"The band is back together!" "Loving the new Fords Gin displays that were made. It’s fun to see that we might get featured in a store or two in our future #gindisplay"